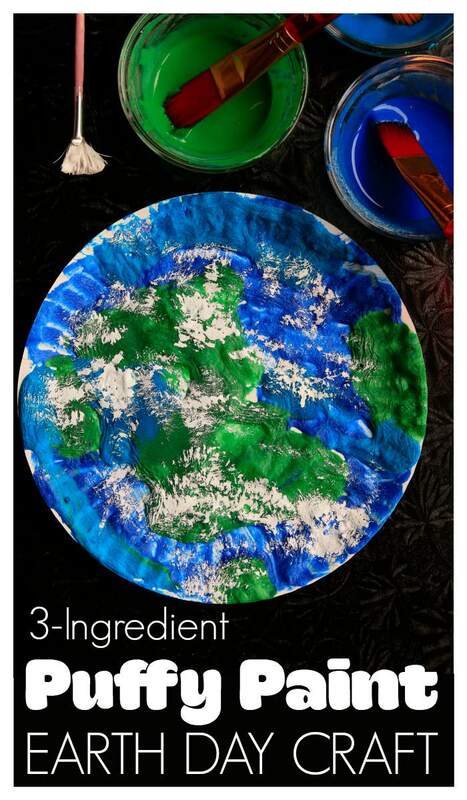 3-Ingredients and a paper plate is all you’ll need for this textured puffy paint Earth Day craft. 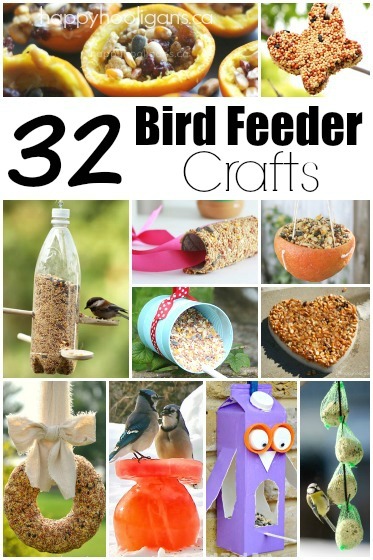 This is a great Earth Day craft for kids of all ages to make. 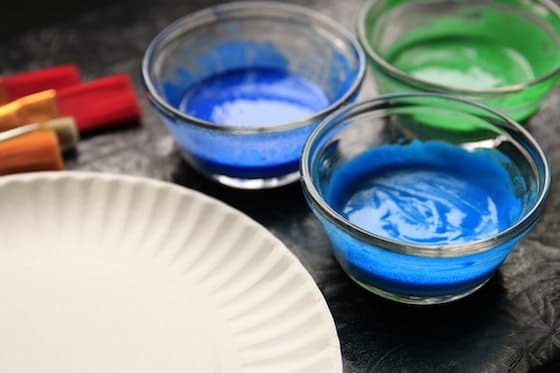 We’re using our homemade puffy paint recipe to paint our Earths, and then we’ll put it in the microwave and it will puff right up. The hooligans and I take pride in the effort we make to be environmentally friendly here in my daycare. We compost and recycle, we make eco-friendly homemade laundry detergent, and we water our gardens with water collected in the rain barrel in our backyard. 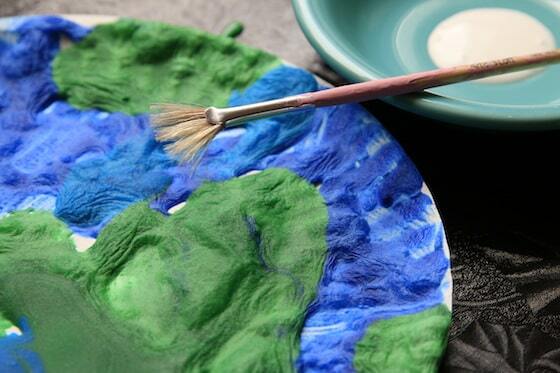 We like to use recycled or natural materials when crafting, and often make our own earth-friendly paints. 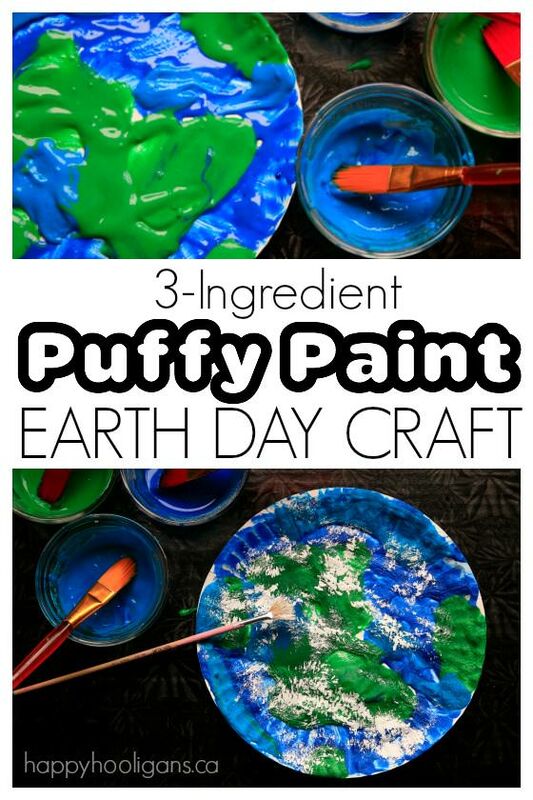 Today we’re using our favourite 3-ingredient puffy paint recipe for this year’s Earth Day craft – a textured puffy Earth. 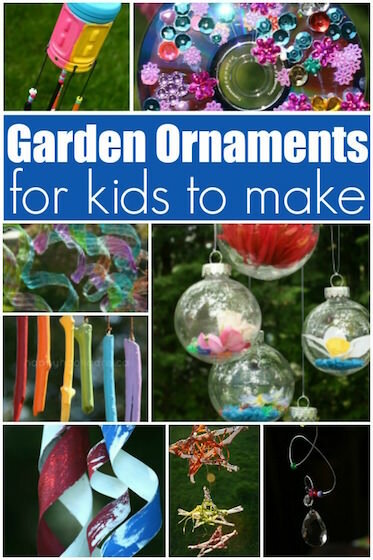 If you’re looking for a last-minute Earth Day craft for toddlers and preschoolers, this project is perfect. 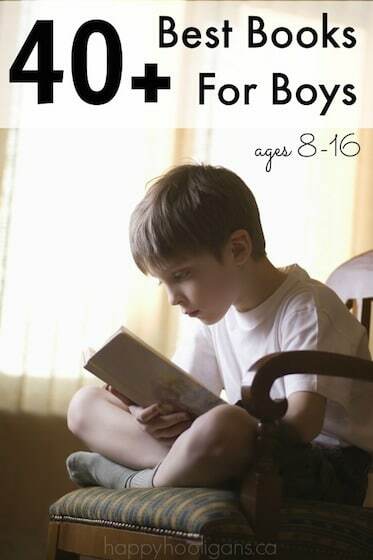 You can whip up the puffy paints quickly, and the painting process is fun and easy. And because you put your art into the microwave to puff up the paint, it dries quickly too! 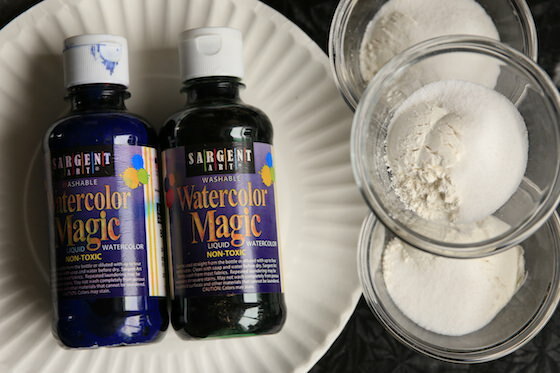 Using the recipe from our puffy paint post, mix your paint to a thick consistency. 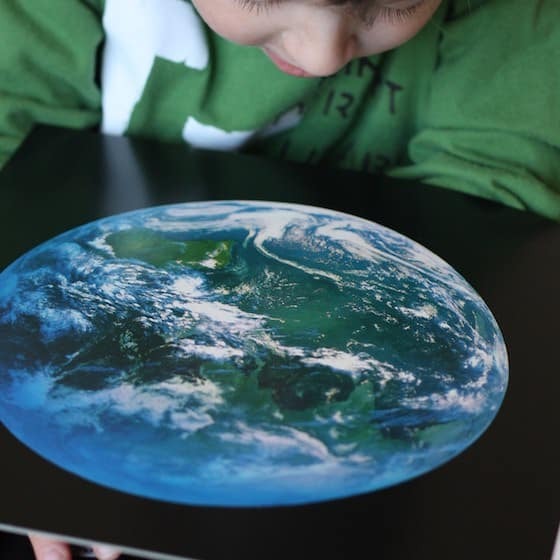 Before beginning our project, we pulled out one of our favourite coffee table books, and looked some images of Earth photographed from space. This gave the kids an idea of what Earth looks like from afar. They studied the oceans, continents and cloud formations, and then we got down to business. 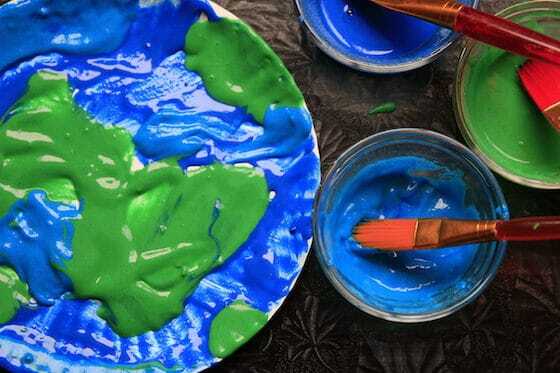 First we blobbed on our green paint to form our continents. 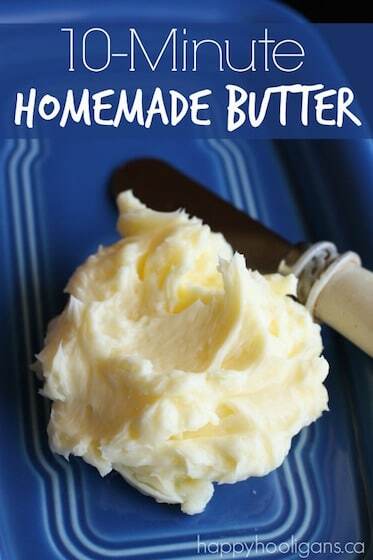 The thicker you apply the paint, the puffier it will be when you microwave it. 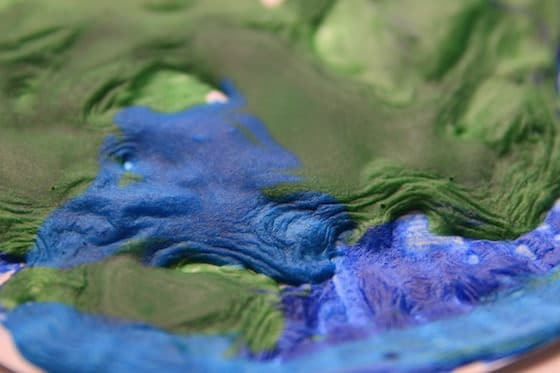 Older children may want to replicate the shapes of the continents, but toddlers and preschoolers can just paint however they wish. Then we filled the rest of the paper pate in with a thick layer of our blue paints. 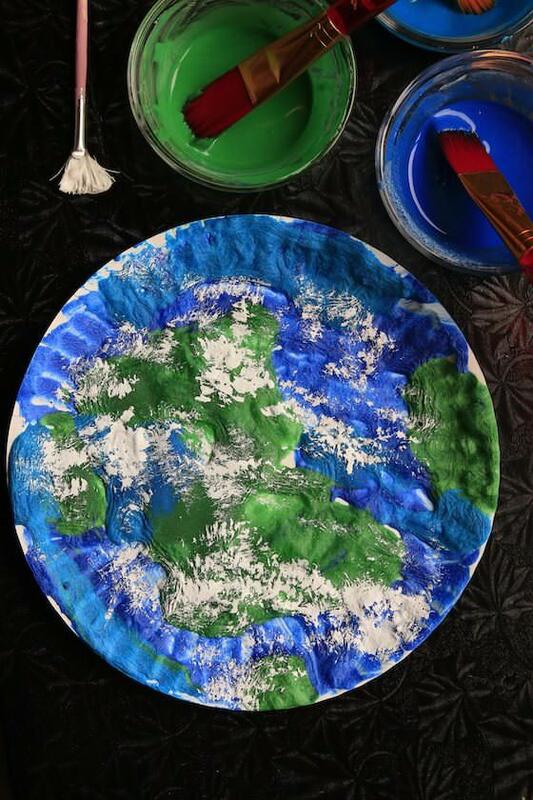 While the kids were painting, we talked about the importance of caring for our planet, and how we can do our part to keep the Earth clean and healthy. 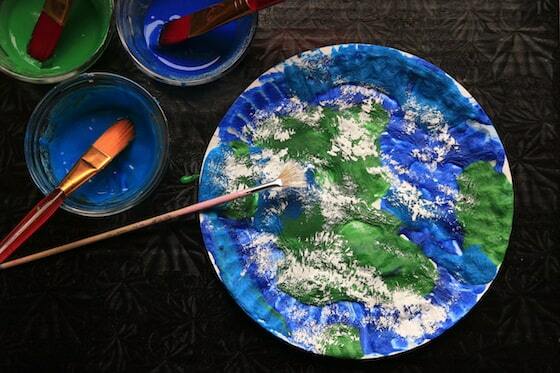 When the kids were finished painting their paper plates, they were ready to go into the microwave. Place your paper plate on a paper towel in the microwave. The paper towel will absorb any condensation that forms on the back of the plate. Microwave your project on high for 30 seconds, and then check to see how things look. The paint will have puffed up nicely in areas, but it may still be wet in some areas. 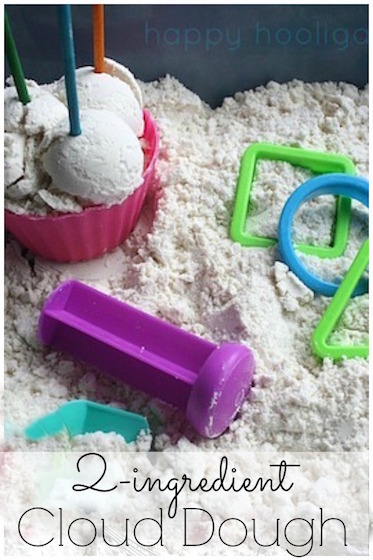 You’ll be able to tell at a glance because those areas will look like wet dough. If that’s the case, pop your plate back into the microwave, and nuke it in 10 second intervals until the surface is dry. Now it’s time to finish with the cloud formations. 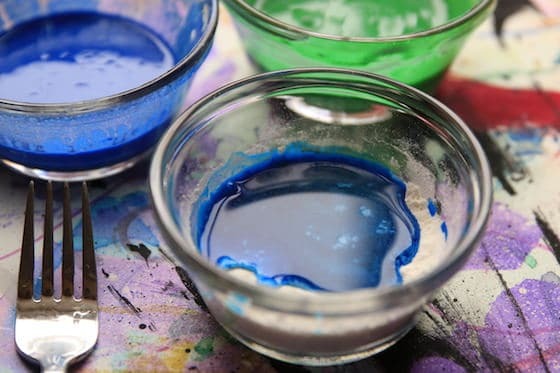 With a another paintbrush, have your child dab white paint all over the plate. Note: it may be a good idea to dab some of the white paint on a piece of paper towel first, so it goes on sparingly. And there you have it! A textured, puffy planet Earth for Earth Day. Is there any way to make the puffy paint without microwaving it? 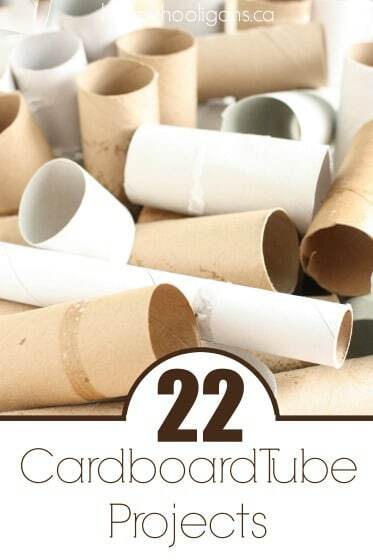 I think it sounds like fun, but I do not have access to a microwave at the center I work at.